The Green Bay Packers and the NFL recently announced a new partnership between the Milwaukee County Parks and United Way as part of the NFL/United Way “Hometown Huddle” day of service. This is the first year that the Packers will focus the NFL/United Way “Hometown Huddle” in Milwaukee County, with all previous efforts having occurred in Green Bay. “We are very thankful for the team’s support and hope that we can continue this partnership into the future,” Milwaukee County Executive Chris Abele said. The Hometown Huddle allows teams to showcase their collective support for NFL PLAY 60 through playground and indoor fitness zone builds and hosting health and wellness activities for youth in local communities. NFL PLAY 60 encourages children to be active for 60 minutes every day to help reverse the trend of childhood obesity. 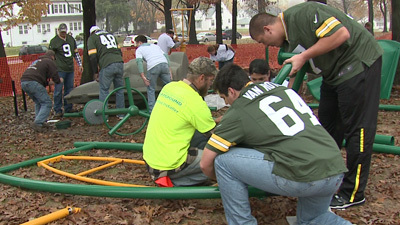 The Packers and NFL gave a generous donation for a new playground at Smith Park. Green Bay Packers players including Brandon Bostick, BJ Coleman, Andrew Datko, and Greg Van Roten and outreach staff along with Milwaukee County Parks staff, United Way staff, and schoolchildren participated in the playground installation this past Tuesday, Oct. 23. Smith Park, 5462 N 33 St., was selected by representatives of the Packers, United Way, MN/WI Playgrounds, and the Milwaukee County Parks Department to take advantage of the collaborative project which will provide an innovative playground, including 5 major components and swings. For more information on Milwaukee County Playground locations please go to countyparks.com. Since we like to promote environmental awareness here, it is nice to note that Milwaukee County Parks staff removed the existing play unit and are salvaging any materials that may be reused in the park system. Materials that cannot be reused will be recycled.